Embrace yourself with the Sassi Bar Stool Black, a comfortable yet beautiful design to enrich your kitchen bar area. 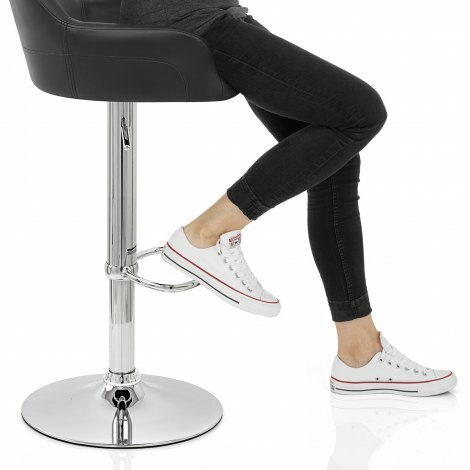 A magnificent piece that will make a distinct statement, the Sassi Bar Stool radiates modern sophistication and is simply unmissable. 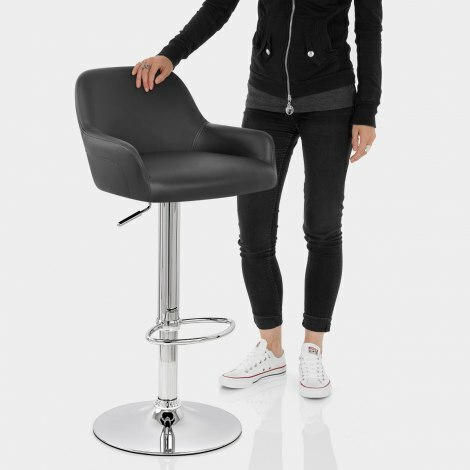 The comfortable seat, cloaked in black faux leather, comes with a backrest and has an encompassing design to give the owner ultimate support when seated. The seat is placed upon a chrome plated steel frame, which has the added bonus of a semi-circular footrest. Within this is the gas lift mechanism, which allows for the height of the stool to be modified, as well as the freedom of 360-degree swivel action. The frame is mounted upon a circular chrome base, which is fitted with a protective rubber ring to look after the floor. "They are comfortable and just like the photo"
Easy to assemble great quality very pleased. Very comfortable easy to put together and look smart. The stools purchased were delivered next day which was great. Very easily to put together but I would say remember to take the plastic cap of the bar which raises and drops the stool. If you don't it will not work. Otherwise great value stool. Bought two a couple of years ago and well pleased with quality, service and price of product so when my son required a couple of bar stools recommended Atlantic to him and ended up purchasing two more stools and once again can’t fault quality, service or price top store. Very happy would highly recommend.